Many visitors prefer the freedom of a short-term apartment let. Prices are often considerably less than equivalent hotels, plus you have the advantage of not having to wake up early to catch breakfast in time! There's a wide range of apartments to choose from, depending on budget and preferred location. You can expect to find all amenities including Internet, fitted kitchen, washing machine, TV, fresh towels and, in many cases, off-street parking. 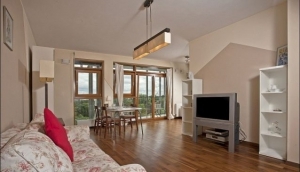 Particularly for families, or friends travelling together, an apartment can make a lot of sense.